Let’s face it, moving is not fun. While it may be exciting to move to a new state, to relocate to a better part of town, or to move in with that special somebody, the physical act and hassle involved with moving is anything but thrilling. The thing about moving, though, is that there are many ways to save money during the process. And, as you can assume, when you make something more cost-effective, it becomes a much more pleasant and enjoyable experience. 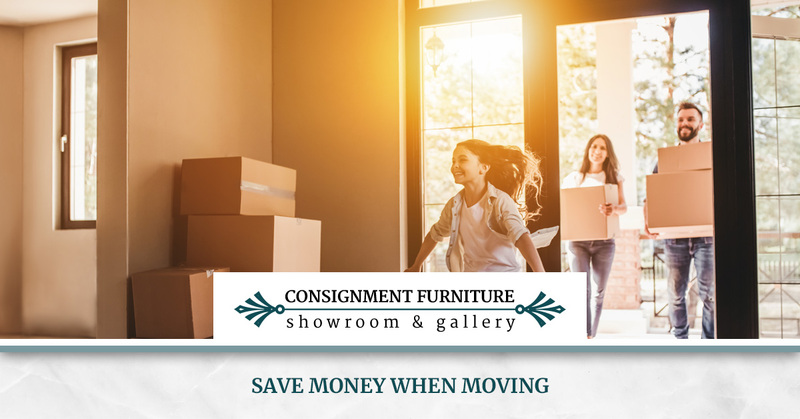 To help make your next move cost-effective, take advantage of a few tips from our consignment furniture store that will help keep money in your wallet. Depending on where you are moving to, hiring a moving company may not always be needed. However, if a moving company will make the process easier, consider finding quotes from moving companies before resorting to do-it-yourself moving. Typically, the fall and winter are considered the off-season, so you may be likely to get a better deal during this time. If you are moving at the end of the semester or in the summer, expect higher prices. Shop around and get quotes from at least three moving companies and then use their quotes to negotiate for a lower rate. Moving is the perfect time to get rid of things that you do not need or no longer use. Have a garage sale, sell things online, donate – whatever it takes to make your moving load lighter. Clearing junk and decluttering your home will also contribute towards the savings you’re able to achieve when moving. Consider it this way — the less you have to move, the faster the entire process will be. If you are moving a significant distance away, your move could be eligible for a tax write-off if it meets certain criteria. If this is the case, you should track the expenses made. In addition to tax write-offs, if you are relocating for a job, your company might pay for a portion of your move. As a general rule of thumb, always keep track of your expenses during major events like moving. The hardest part about moving is, without a doubt, finding a way to transport furniture from one location to another. Unless the furniture item is special, it might make more sense to leave furniture behind. If you cannot sell the furniture, consider selling your used furniture to a consignment furniture store. This they may even pick it up the furniture for you. When you consign your furniture, you save yourself money by carrying less weight as you move, and you have a chance to make money on your consigned piece. Keep in mind, donating furniture is also an option. When you arrive at your new home, you can go the other route and buy quality new or used furniture at a consignment or furniture store. If you’re looking for used furniture in St. Petersburg or Clearwater, Florida, Consignment Furniture Showroom and Gallery is the best way to find quality pieces. We also buy used furniture for those looking to consign! Browse our furniture selection online or stop by either of our used furniture stores.